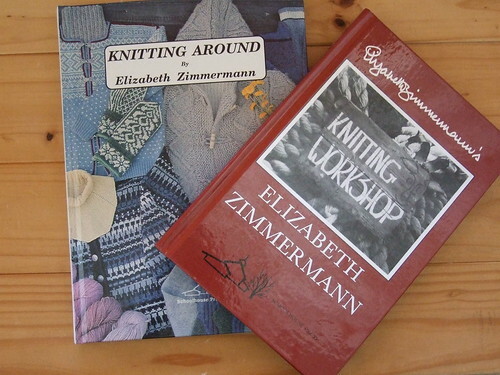 I am a big fan of Elizabeth Zimmerman, and already own Knitting without Tears and Knitting Almanac. I have made several projects from those books (tomten jacket, ganomy hat, 2 needle baby sweater) and I really like her style of pattern writing. The photos in her books seem rather dated, but I have seen some great interpretions of her patterns on Flickr and Ravelry. 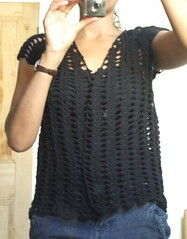 Here is a progress picture of the shell-stitch wrap around cardigan…. I’m getting a bit bored with it now, but I am determined not to start anything else before it is finished, not least because I need a new cardigan to wear. I currently have four unfinshed projects (including this one) and yarn for three more projects. I want to finish at least a couple of these before buying more yarn.